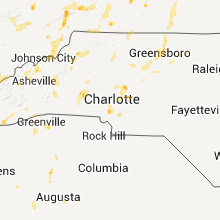 The Summerfield, NC area has had 2 reports of on-the-ground hail by trained spotters, and has been under severe weather warnings 49 times during the past 12 months. Doppler radar has detected hail at or near Summerfield, NC on 34 occasions, including 3 occasions during the past year. 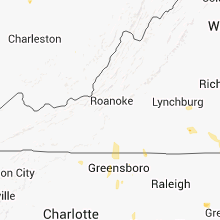 4/19/2019 4:39 PM EDT At 438 pm edt, a severe thunderstorm was located 9 miles south of mcleansville, or 10 miles southeast of greensboro, moving northeast at 30 mph (radar indicated). Hazards include 60 mph wind gusts. Expect damage to roofs, siding, and trees. locations impacted include, greensboro, mcleansville, gibsonville, pleasant garden, haw river state park, lake guilford mackintosh marina, forest oaks, lake jeanette marina, monticello and climax. A tornado watch remains in effect until 800 pm edt for central north carolina. 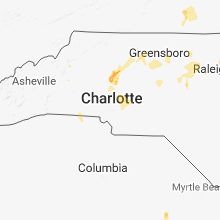 4/19/2019 3:38 PM EDT The severe thunderstorm warning for guilford county will expire at 345 pm edt, the storm which prompted the warning has moved out of the area. therefore the warning will be allowed to expire. however gusty winds are still possible. a tornado watch remains in effect until 500 pm edt for central north carolina. 4/19/2019 3:26 PM EDT The severe thunderstorm warning for western rockingham and henry counties and the city of martinsville will expire at 330 pm edt, the storm which prompted the warning has moved out of the area. therefore, the warning will be allowed to expire. a tornado watch remains in effect until 500 pm edt for north central north carolina, and south central, southwestern and west central virginia. when it is safe to do so, please send your reports of hail of any size, as well as reports of any wind damage, including downed trees or large limbs, to the national weather service by calling toll free at 1, 8 6 6, 2 1 5, 4 3 2 4. reports and pictures can also be shared on the national weather service blacksburg facebook page and on twitter. 4/19/2019 3:21 PM EDT At 321 pm edt, a severe thunderstorm was located over spencer, moving north at 50 mph (radar indicated). Hazards include 60 mph wind gusts. Expect damage to roofs, siding, and trees. locations impacted include, martinsville, mayodan, madison, stoneville, and spencer. this includes the following locations the martinsville speedway and martinsville airport. A tornado watch remains in effect until 500 pm edt for north central north carolina, and south central, southwestern and west central virginia. 4/19/2019 3:12 PM EDT At 312 pm edt, a severe thunderstorm was located near sandy ridge, moving northeast at 55 mph (radar indicated). Hazards include 60 mph wind gusts. Expect damage to roofs, siding, and trees. locations impacted include, martinsville, mayodan, madison, stoneville, and spencer. this includes the following locations the martinsville speedway and martinsville airport. A tornado watch remains in effect until 500 pm edt for north central and northwestern north carolina, and south central, southwestern and west central virginia. 4/19/2019 2:37 PM EDT At 237 pm edt, a severe thunderstorm was located near winston-salem, moving north at 50 mph (radar indicated). Hazards include 60 mph wind gusts and quarter size hail. Hail damage to vehicles is expected. Expect wind damage to roofs, siding, and trees. 4/15/2019 1:35 AM EDT At 135 am edt, severe thunderstorms were located along a line extending from near bethany to near high point, moving northeast at 55 mph (radar indicated). Hazards include 60 mph wind gusts. Expect damage to roofs, siding, and trees. locations impacted include, greensboro, high point, mcleansville, summerfield, stokesdale, pleasant garden, jamestown, forest oaks, lake jeanette marina and randleman regional reservior marina. A tornado watch remains in effect until 500 am edt for central north carolina. 4/15/2019 1:22 AM EDT At 121 am edt, severe thunderstorms were located along a line extending from near kernersville to near thomasville, moving northeast at 55 mph (radar indicated). Hazards include 60 mph wind gusts. Expect minor damage to roofs, siding, and trees. locations impacted include, greensboro, high point, randleman, thomasville, kernersville, mcleansville, archdale, summerfield, trinity and stokesdale. A tornado watch remains in effect until 500 am edt for central north carolina. 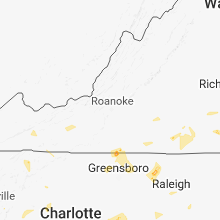 4/12/2019 4:11 PM EDT The severe thunderstorm warning for northeastern randolph and eastern guilford counties will expire at 415 pm edt, the storms which prompted the warning have moved out of the area. therefore the warning will be allowed to expire. however heavy rain is still possible with these thunderstorms. to report severe weather, contact your nearest law enforcement agency. they will relay your report to the national weather service raleigh. 4/12/2019 3:44 PM EDT At 343 pm edt, severe thunderstorms showing weak signs of rotation were located along a line extending from 6 miles south of bethany to near mcleansville to 11 miles southwest of elon college, moving northeast at 35 mph (emergency management reports wind damage across northern randolph county). Hazards include 60 mph wind gusts and nickel size hail. Expect damage to roofs, siding, and trees. Locations impacted include, greensboro, asheboro, mcleansville, summerfield, gibsonville, pleasant garden, liberty, ramseur, franklinville and lake guilford mackintosh marina. 4/12/2019 3:34 PM EDT At 333 pm edt, severe thunderstorms were located along a line extending from 8 miles south of bethany through greensboro to 7 miles northeast of randleman, moving northeast at 45 mph (emergency management reports wind damage in the form of downed trees and powerlines across the city of high point). Hazards include 60 mph wind gusts, heavy rainfall, and nickel size hail. Expect damage to roofs, siding, and trees. Locations impacted include, greensboro, asheboro, randleman, mcleansville, summerfield, gibsonville, stokesdale, pleasant garden, liberty and ramseur. 4/8/2019 4:04 PM EDT At 403 pm edt, severe thunderstorms were located along a line extending from ellisboro to near harrisons crossroads, moving east at 30 mph (radar indicated). Hazards include 60 mph wind gusts and quarter size hail. Hail damage to vehicles is expected. expect wind damage to roofs, siding, and trees. Locations impacted include, eden, reidsville, wentworth, mayfield, and intelligence. 4/8/2019 3:37 PM EDT At 336 pm edt, severe thunderstorms were located along a line extending from near germanton to near ellisboro, moving east at 30 mph (radar indicated). Hazards include 60 mph wind gusts and quarter size hail. Hail damage to vehicles is expected. Expect wind damage to roofs, siding, and trees. 8/2/2018 6:38 PM EDT At 634 pm edt, a severe thunderstorm extended from near lewisville to near walkertown, moving north at 15 mph. trees have been downed by the combination of gusty thunderstorm winds over saturated ground (radar indicated). Hazards include 60 mph wind gusts. Expect damage to trees. Locations impacted include, kernersville, clemmons, bermuda run, huntsville, lewisville, summerfield, stokesdale, walkertown and rural hall. 8/2/2018 4:43 PM EDT At 443 pm edt, severe thunderstorms were located along a line extending from near meadows to 6 miles south of pine hall, moving northeast at 15 mph (radar indicated). Hazards include 60 mph wind gusts. Expect damage to roofs, siding, and trees. Locations impacted include, mayodan, madison, walnut cove, stoneville, and sandy ridge. 7/22/2018 8:53 PM EDT The severe thunderstorm warning for northern guilford county will expire at 900 pm edt, the storms which prompted the warning have moved out of the area. therefore the warning will be allowed to expire. to report severe weather, contact your nearest law enforcement agency. they will relay your report to the national weather service raleigh. 7/22/2018 8:12 PM EDT At 812 pm edt, severe thunderstorms were located along a line extending from near siler city to near mcleansville to 6 miles east of kernersville, moving northwest at 20 mph (radar indicated). Hazards include 60 mph wind gusts and penny size hail. Expect damage to roofs, siding, and trees. Locations impacted include, greensboro, high point, burlington, graham, siler city, kernersville, mcleansville, elon college, summerfield and gibsonville. 7/21/2018 10:08 PM EDT At 1008 pm edt, a severe thunderstorm was located 7 miles southeast of pine hall, or 9 miles southeast of walnut cove, moving east at 25 mph (radar indicated). Hazards include 60 mph wind gusts and quarter size hail. Hail damage to vehicles is expected. expect wind damage to roofs, siding, and trees. Locations impacted include, summerfield, stokesdale and colfax. 7/21/2018 9:55 PM EDT At 955 pm edt, a severe thunderstorm was located near walnut cove, moving east at 25 mph (radar indicated). Hazards include 60 mph wind gusts and quarter size hail. Hail damage to vehicles is expected. expect wind damage to roofs, siding, and trees. Locations impacted include, kernersville, summerfield, stokesdale, belews lake, colfax and belews creek. 7/21/2018 9:39 PM EDT At 939 pm edt, a severe thunderstorm was located near germanton, or near walnut cove, moving east at 25 mph (radar indicated). Hazards include 60 mph wind gusts and quarter size hail. Hail damage to vehicles is expected. Expect wind damage to roofs, siding, and trees. 7/6/2018 2:55 PM EDT The severe thunderstorm warning for southeastern stokes and rockingham counties will expire at 300 pm edt, the storms which prompted the warning have moved out of the area. therefore, the warning will be allowed to expire. however small hail, gusty winds and heavy rain are still possible with these thunderstorms. when it is safe to do so, please send your reports of hail of any size, as well as reports of any wind damage, including downed trees or large limbs, to the national weather service by calling toll free at 1, 8 6 6, 2 1 5, 4 3 2 4. reports and pictures can also be shared on the national weather service blacksburg facebook page and on twitter. remember, a severe thunderstorm warning still remains in effect for northeastern rockingham county until 345 pm from a cluster of storms centered near mayfield, nc. 7/6/2018 2:49 PM EDT At 232 pm edt, severe thunderstorms were located along a line extending from near harrisons crossroads to 6 miles north of kernersville to near huntsville, moving south at 5 mph (radar indicated). Hazards include 60 mph wind gusts and quarter size hail. Hail damage to vehicles is expected. expect wind damage to roofs, siding, and trees. Locations impacted include, greensboro, winston-salem, high point, kernersville, clemmons, bermuda run, mcleansville, lewisville, summerfield and stokesdale. 7/6/2018 2:38 PM EDT At 237 pm edt, severe thunderstorms were clustered along a line extending from near harrisons crossroads to eden to near ellisboro, moving south at 20 mph (radar indicated). Hazards include 60 mph wind gusts and quarter size hail. Hail damage to vehicles is expected. expect wind damage to roofs, siding, and trees. Locations impacted include, eden, reidsville, wentworth, mayodan, and madison. 7/6/2018 2:33 PM EDT At 232 pm edt, severe thunderstorms were located along a line extending from near harrisons crossroads to 6 miles north of kernersville to near huntsville, moving south at 5 mph (radar indicated). Hazards include 60 mph wind gusts and quarter size hail. Hail damage to vehicles is expected. expect wind damage to roofs, siding, and trees. Locations impacted include, greensboro, winston-salem, high point, kernersville, clemmons, bermuda run, mcleansville, lewisville, summerfield and stokesdale. 7/6/2018 2:07 PM EDT The national weather service in blacksburg has issued a * severe thunderstorm warning for. southeastern stokes county in north central north carolina. rockingham county in north central north carolina. 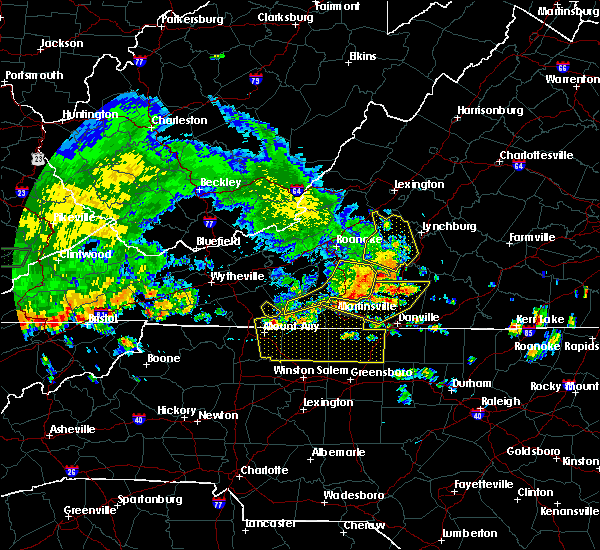 Until 300 pm edt * at 206 pm edt, severe thunderstorms were located along a line. 5/10/2018 5:02 PM EDT At 502 pm edt, a severe thunderstorm was located near wentworth, moving northeast at 45 mph (radar indicated). Hazards include 60 mph wind gusts and quarter size hail. Hail damage to vehicles is expected. expect wind damage to roofs, siding, and trees. Locations impacted include, reidsville, wentworth, madison, walnut cove, and pine hall. 5/10/2018 4:34 PM EDT At 434 pm edt, a severe thunderstorm was located over pine hall, moving northeast at 45 mph (radar indicated). Hazards include 60 mph wind gusts and quarter size hail. Hail damage to vehicles is expected. Expect wind damage to roofs, siding, and trees. 5/6/2018 2:06 PM EDT At 205 pm edt, a severe thunderstorm was located over greensboro, moving east at 25 mph (radar indicated). Hazards include 60 mph wind gusts and quarter size hail. Hail damage to vehicles is expected. expect wind damage to roofs, siding, and trees. Locations impacted include, greensboro, mcleansville, forest oaks, lake townsend marina, lake townsend, lake jeanette marina, monticello and lake brandt. 5/6/2018 1:54 PM EDT At 153 pm edt, a severe thunderstorm was located near kernersville, or 7 miles west of greensboro, moving east at 20 mph (radar indicated). Hazards include 60 mph wind gusts and quarter size hail. Hail damage to vehicles is expected. Expect wind damage to roofs, siding, and trees. 4/15/2018 5:09 PM EDT At 509 pm edt, a severe thunderstorm capable of producing a tornado was located near greensboro, moving north at 55 mph (radar indicated rotation). Hazards include tornado. Flying debris will be dangerous to those caught without shelter. mobile homes will be damaged or destroyed. damage to roofs, windows, and vehicles will occur. Tree damage is likely. 4/15/2018 5:06 PM EDT At 505 pm edt, a severe thunderstorm was located near greensboro, moving north at 55 mph (radar indicated). Hazards include 70 mph wind gusts and quarter size hail. Hail damage to vehicles is expected. expect considerable tree damage. wind damage is also likely to mobile homes, roofs, and outbuildings. locations impacted include, greensboro, winston-salem, high point, asheboro, randleman, north carolina zoo, kernersville, seagrove, mcleansville and archdale. A tornado watch remains in effect until 1100 pm edt for central north carolina. 10/23/2017 7:43 PM EDT The severe thunderstorm warning for northeastern stokes. rockingham. east central floyd. southwestern pittsylvania. henry. franklin and eastern patrick counties and the city of martinsville will expire at 745 pm edt. the storms which prompted the warning have moved out of the area. Therefore the warning will be allowed to expire. 10/23/2017 6:46 PM EDT At 645 pm edt, severe thunderstorms were located along a line extending from near floyd to near ellisboro, moving northeast at 15 mph (radar indicated). Hazards include 60 mph wind gusts and quarter size hail. Hail damage to vehicles is expected. Expect wind damage to roofs, siding, and trees. 7/23/2017 5:11 PM EDT At 511 pm edt, a severe thunderstorm was located over kernersville, or 9 miles south of walnut cove, moving southeast at 40 mph (radar indicated). Hazards include 60 mph wind gusts. Expect damage to roofs, siding, and trees. Locations impacted include, greensboro, winston-salem, high point, kernersville, summerfield, stokesdale, walkertown, haw river state park, oak hollow marina and belews creek. 7/23/2017 4:53 PM EDT At 452 pm edt, a severe thunderstorm was located near winston-salem, moving southeast at 15 mph (radar indicated). Hazards include 60 mph wind gusts. Expect damage to roofs, siding, and trees. Locations impacted include, greensboro, winston-salem, high point, kernersville, lewisville, summerfield, stokesdale, walkertown, rural hall and haw river state park. 7/22/2017 5:40 PM EDT The severe thunderstorm warning for forsyth and western guilford counties will expire at 545 pm edt, the storms which prompted the warning have weakened below severe limits, and no longer pose an immediate threat to life or property. therefore the warning will be allowed to expire. however gusty winds and heavy rain are still possible with these thunderstorms. to report severe weather, contact your nearest law enforcement agency. they will relay your report to the national weather service raleigh. 7/22/2017 5:27 PM EDT At 526 pm edt, severe thunderstorms were located along a line extending from near germanton to near kernersville to near clemmons, moving southeast at 20 mph (radar indicated). Hazards include 60 mph wind gusts. Expect damage to roofs, siding, and trees. Locations impacted include, greensboro, winston-salem, high point, kernersville, lewisville, summerfield, stokesdale, walkertown, pleasant garden and jamestown. 7/22/2017 5:16 PM EDT At 515 pm edt, severe thunderstorms were located along a line extending from near germanton to near kernersville to near enon, moving southeast at 20 mph (radar indicated). Hazards include 60 mph wind gusts and penny size hail. Expect damage to roofs, siding, and trees. Locations impacted include, greensboro, winston-salem, high point, kernersville, lewisville, summerfield, stokesdale, walkertown, pleasant garden and jamestown. 7/22/2017 5:07 PM EDT At 506 pm edt, severe thunderstorms were located along a line extending from germanton to near king, moving southeast at 20 mph (radar indicated). Hazards include 60 mph wind gusts and penny size hail. Expect damage to roofs, siding, and trees. Locations impacted include, greensboro, winston-salem, high point, kernersville, mcleansville, lewisville, summerfield, stokesdale, walkertown and pleasant garden. 7/18/2017 6:22 PM EDT The severe thunderstorm warning for southeastern stokes and southeastern rockingham counties will expire at 630 pm edt, the storm which prompted the warning has weakened below severe limits, and no longer poses an immediate threat to life or property. therefore the warning will be allowed to expire. when it is safe to do so, please send your reports of hail of any size, as well as reports of any wind damage, including downed trees or large limbs, to the national weather service by calling toll free at 1, 8 6 6, 2 1 5, 4 3 2 4. reports and pictures can also be shared on the national weather service blacksburg facebook page and on twitter. 7/18/2017 6:20 PM EDT At 620 pm edt, a severe thunderstorm was located 7 miles southwest of bethany, moving southwest at 15 mph (radar indicated). Hazards include 60 mph wind gusts and quarter size hail. Hail damage to vehicles is expected. expect wind damage to roofs, siding, and trees. Locations impacted include, reidsville, wentworth, walnut cove, pine hall, and intelligence. 7/18/2017 5:55 PM EDT At 555 pm edt, a severe thunderstorm was located near bethany, moving west at 10 mph (radar indicated). Hazards include 60 mph wind gusts and quarter size hail. Hail damage to vehicles is expected. expect wind damage to roofs, siding, and trees. Locations impacted include, reidsville, wentworth, walnut cove, pine hall, and intelligence. 7/18/2017 5:52 PM EDT The severe thunderstorm warning for southwestern alamance, northeastern randolph and eastern guilford counties will expire at 600 pm edt, the storm which prompted the warning has weakened below severe limits, and no longer poses an immediate threat to life or property. therefore the warning will be allowed to expire. however gusty winds and heavy rain are still possible with this thunderstorm. to report severe weather, contact your nearest law enforcement agency. they will relay your report to the national weather service raleigh. 7/18/2017 5:29 PM EDT At 528 pm edt, a severe thunderstorm was located 7 miles south of mcleansville, or 11 miles southwest of burlington, moving southwest at 10 mph (radar indicated). Hazards include 60 mph wind gusts and quarter size hail. Hail damage to vehicles is expected. expect wind damage to roofs, siding, and trees. Locations impacted include, greensboro, burlington, mcleansville, elon college, gibsonville, pleasant garden, liberty, alamance, lake guilford mackintosh marina and forest oaks. 7/18/2017 5:25 PM EDT The national weather service in blacksburg has issued a * severe thunderstorm warning for. southeastern stokes county in north central north carolina. southeastern rockingham county in north central north carolina. 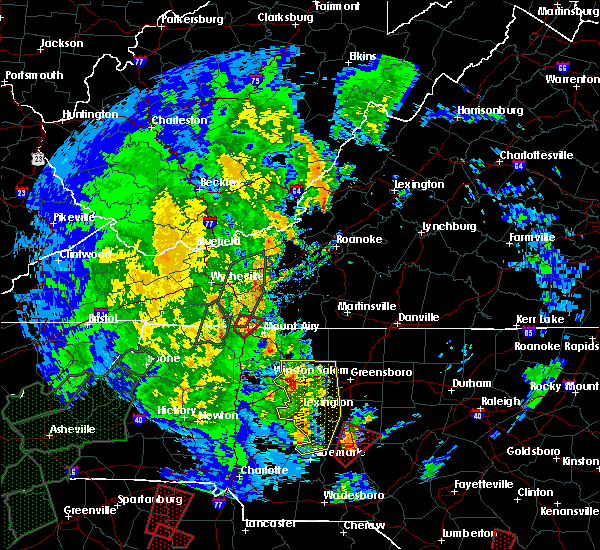 Until 630 pm edt * at 525 pm edt, a severe thunderstorm was located over monroeton,. 7/18/2017 5:16 PM EDT At 516 pm edt, a severe thunderstorm was located near mcleansville, or 9 miles southwest of burlington, moving southwest at 10 mph (radar indicated). Hazards include 60 mph wind gusts and quarter size hail. Hail damage to vehicles is expected. Expect wind damage to roofs, siding, and trees. 6/13/2017 4:54 PM EDT At 453 pm edt, a severe thunderstorm was located near pti airport or near greensboro, moving southeast at 25 mph (radar indicated). Hazards include 60 mph wind gusts and quarter size hail. Hail damage to vehicles is expected. expect wind damage to roofs, siding, and trees. Locations impacted include, pti airport, greensboro, high point, mcleansville, summerfield, lake townsend marina, lake townsend, lake jeanette marina, monticello, lake brandt and colfax. 6/13/2017 4:31 PM EDT At 431 pm edt, a severe thunderstorm was located 8 miles northeast of kernersville, or 11 miles northwest of greensboro, moving south at 30 mph (radar indicated). Hazards include 60 mph wind gusts and quarter size hail. Hail damage to vehicles is expected. Expect wind damage to roofs, siding, and trees. 5/19/2017 4:39 PM EDT At 436 pm edt, severe thunderstorms were located along a line extending from mcleansville to near greensboro, moving east at 30 mph (radar indicated). Hazards include 60 mph wind gusts and quarter size hail. Hail damage to vehicles is possible. expect wind damage to trees and possible damage to roofs and siding. Locations impacted include, greensboro, high point, mcleansville, summerfield, gibsonville, stokesdale, pleasant garden, jamestown, lake guilford mackintosh marina and forest oaks. 5/5/2017 3:21 AM EDT At 307 am edt, severe thunderstorms were located along a line extending from 6 miles south of high point to 9 miles north of asheboro to near randleman, moving northeast at 50 mph (radar indicated). Hazards include 60 mph wind gusts. Expect damage to roofs, siding, and trees. locations impacted include, greensboro, high point, asheboro, randleman, north carolina zoo, mcleansville, archdale, summerfield, gibsonville and pleasant garden. A tornado watch remains in effect until 900 am edt for central north carolina. 5/5/2017 3:08 AM EDT At 307 am edt, severe thunderstorms were located along a line extending from 6 miles south of high point to 9 miles north of asheboro to near randleman, moving northeast at 50 mph (radar indicated). Hazards include 60 mph wind gusts. Expect damage to roofs, siding, and trees. locations impacted include, greensboro, high point, asheboro, randleman, north carolina zoo, mcleansville, archdale, summerfield, gibsonville and pleasant garden. A tornado watch remains in effect until 900 am edt for central north carolina. 5/1/2017 6:37 PM EDT At 636 pm edt, a severe thunderstorm was located over lake townsend, moving northeast at 60 mph. (radar indicated). Hazards include 60 mph wind gusts. Expect damage to roofs, siding, and trees. Locations impacted include, greensboro, high point, jamestown, lake townsend marina, lake townsend, lake jeanette marina, monticello, lake brandt, oak hollow marina and haw river state park. 5/1/2017 6:26 PM EDT At 625 pm edt, a severe thunderstorm was located over greensboro, moving northeast at 40 mph (radar indicated). Hazards include 60 mph wind gusts. Expect damage to roofs, siding, and trees. Locations impacted include, greensboro, high point, jamestown, lake townsend marina, lake townsend, lake jeanette marina, monticello, lake brandt, oak hollow marina and haw river state park. 5/1/2017 6:14 PM EDT At 613 pm edt, severe thunderstorms were located along a line extending from stokesdale to high point, moving northeast at 60 mph (radar indicated). Hazards include 60 mph wind gusts. Expect damage to roofs, siding, and trees. Locations impacted include, greensboro, high point, thomasville, summerfield, stokesdale, jamestown, lake jeanette marina, monticello, oak hollow marina and lake townsend marina. 5/1/2017 6:07 PM EDT At 607 pm edt, severe thunderstorms were located along a line extending from near rocky mount to near price to near kernersville, moving northeast at 45 mph (law enforcement). Hazards include 60 mph wind gusts and quarter size hail. Minor damage to vehicles is possible. expect wind damage to trees and power lines. Locations impacted include, danville, eden, reidsville, martinsville, and wentworth. 5/1/2017 5:48 PM EDT At 546 pm edt, a severe thunderstorm was located 6 miles south of ellisboro, or 9 miles southeast of walnut cove, moving northeast at 40 mph (radar indicated). Hazards include 60 mph wind gusts. Expect damage to roofs, siding, and trees. Locations impacted include, summerfield and stokesdale. 5/1/2017 5:32 PM EDT At 530 pm edt, severe thunderstorms were located along a line extending from near woolwine to near hanging rock state park to 7 miles east of mocksville, moving northeast at 45 mph (law enforcement. at 504 pm, yadkin nc county warning point reported multiple trees down in east bend). Hazards include 60 mph wind gusts and quarter size hail. Minor damage to vehicles is possible. Expect wind damage to trees and power lines. 4/6/2017 6:03 AM EDT At 602 am edt, a severe thunderstorm was located near dry fork, moving northeast at 40 mph (radar indicated). Hazards include 60 mph wind gusts and quarter size hail. Hail damage to vehicles is expected. expect wind damage to roofs, siding, and trees. Locations impacted include, danville, eden, wentworth, mayodan, and madison. 4/6/2017 5:31 AM EDT At 531 am edt, a severe thunderstorm was located near sandy level, moving northeast at 40 mph (radar indicated). Hazards include 60 mph wind gusts and quarter size hail. Hail damage to vehicles is expected. Expect wind damage to roofs, siding, and trees. 11/30/2016 7:51 PM EST The severe thunderstorm warning for randolph, guilford and eastern forsyth counties will expire at 800 pm est, the storms which prompted the warning have weakened below severe limits, and have exited the warned area. therefore the warning will be allowed to expire. to report severe weather, contact your nearest law enforcement agency. they will relay your report to the national weather service raleigh. 11/30/2016 7:39 PM EST At 738 pm est, severe thunderstorms were located along a line extending from near camp springs to near mcleansville to near high point, moving northeast at 45 mph (radar indicated). Hazards include 60 mph wind gusts. Expect damage to roofs. siding. and trees. Locations impacted include, greensboro, winston-salem, high point, asheboro, randleman, north carolina zoo, kernersville, seagrove, mcleansville and summerfield. 9/28/2016 7:51 PM EDT At 751 pm edt, a severe thunderstorm was located over high point, moving northeast at 30 mph (radar indicated). Hazards include 60 mph wind gusts and quarter size hail. Hail damage to vehicles is expected. expect wind damage to roofs, siding, and trees. locations impacted include, greensboro, high point, jamestown and oak hollow marina. A severe thunderstorm watch remains in effect until 1000 pm edt for central north carolina. 9/28/2016 7:38 PM EDT At 737 pm edt, a severe thunderstorm was located near thomasville, or 7 miles southwest of high point, moving northeast at 30 mph (radar indicated). Hazards include 60 mph wind gusts and quarter size hail. Hail damage to vehicles is expected. Expect wind damage to roofs, siding, and trees. 9/28/2016 5:15 PM EDT At 514 pm edt, a severe thunderstorm was located over greensboro, moving east at 40 mph (radar indicated). Hazards include half dollar size hail. Damage to vehicles is expected. locations impacted include, greensboro, mcleansville, summerfield, gibsonville, lake townsend marina, lake guilford mackintosh marina, lake brandt, lake townsend, lake jeanette marina and monticello. 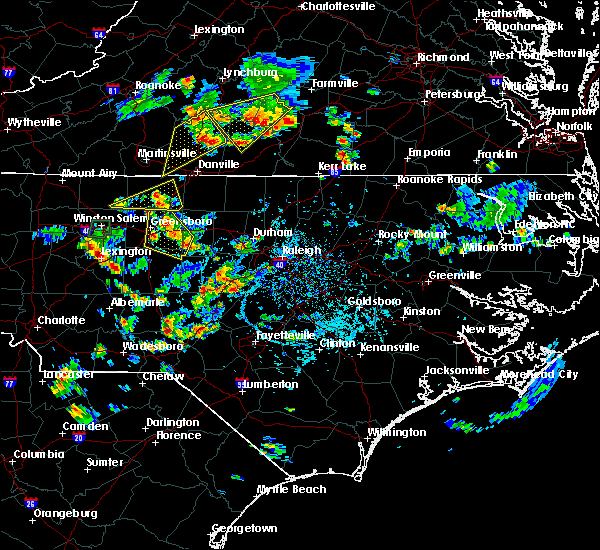 A severe thunderstorm watch remains in effect until 1000 pm edt for central north carolina. 9/28/2016 4:24 PM EDT At 423 pm edt, a severe thunderstorm was located near mcleansville, or 8 miles northeast of greensboro, moving east at 15 mph (radar indicated). Hazards include 60 mph wind gusts and quarter size hail. Hail damage to vehicles is expected. expect wind damage to roofs, siding, and trees. locations impacted include, greensboro, high point, mcleansville, summerfield, gibsonville, lake townsend marina, lake brandt, lake townsend, lake jeanette marina and monticello. A severe thunderstorm watch remains in effect until 1000 pm edt for central north carolina. 9/28/2016 4:01 PM EDT At 359 pm edt, severe thunderstorms were located over northwest greeensboro and near sedge garden, moving northeast at 35 mph (radar indicated). Hazards include 60 mph wind gusts and quarter size hail. Hail damage to vehicles is expected. Expect wind damage to roofs, siding, and trees. 9/28/2016 3:54 PM EDT At 353 pm edt, a severe thunderstorm was located 7 miles northwest of greensboro, moving northeast at 40 mph (radar indicated). Hazards include 60 mph wind gusts and quarter size hail. Hail damage to vehicles is expected. expect wind damage to roofs, siding, and trees. locations impacted include, summerfield, stokesdale and lake brandt. A severe thunderstorm watch remains in effect until 1000 pm edt for central north carolina. 9/28/2016 3:38 PM EDT At 337 pm edt, a severe thunderstorm was located over kernersville, or 10 miles north of high point, moving east at 20 mph (radar indicated). Hazards include 60 mph wind gusts and quarter size hail. Hail damage to vehicles is expected. expect wind damage to roofs, siding, and trees. locations impacted include, winston-salem, kernersville, summerfield, stokesdale, walkertown, lake brandt, sedge garden, colfax and belews lake. 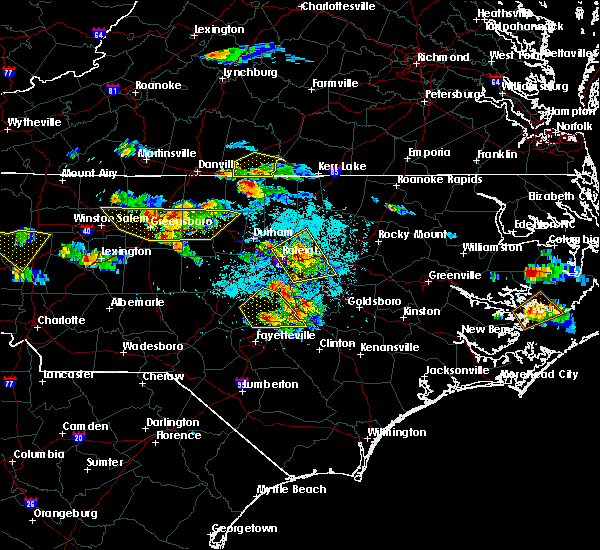 A severe thunderstorm watch remains in effect until 1000 pm edt for central north carolina. 9/28/2016 3:19 PM EDT At 318 pm edt, a severe thunderstorm was located near winston-salem, moving northeast at 25 mph (radar indicated). Hazards include 60 mph wind gusts. Expect damage to roofs. siding. And trees. 8/27/2016 5:41 PM EDT At 539 pm edt, a severe thunderstorm was located 3 miles south of pti airport and near pleasant garden, moving west at 30 mph (radar indicated). Hazards include 60 mph wind gusts. Expect damage to trees. Locations impacted include, greensboro, high point, pleasant garden, jamestown, oak hollow marina and colfax. 7/27/2016 7:00 PM EDT At 700 pm edt, severe thunderstorms were located along a line extending from near germanton to near mcleansville, moving east at 20 mph (radar indicated). Hazards include 60 mph wind gusts and quarter size hail. Hail damage to vehicles is expected. expect wind damage to roofs, siding, and trees. Locations impacted include, greensboro, winston-salem, kernersville, mcleansville, summerfield, gibsonville, stokesdale, walkertown, rural hall and lake townsend marina. 7/27/2016 6:58 PM EDT At 657 pm edt, a severe thunderstorm was located 7 miles south of ellisboro, moving east at 10 mph (radar indicated). Hazards include 60 mph wind gusts and quarter size hail. Hail damage to vehicles is expected. expect wind damage to roofs, siding, and trees. Locations impacted include, reidsville, wentworth, mayodan, madison, and walnut cove. 7/27/2016 6:33 PM EDT At 633 pm edt, a severe thunderstorm was located near pine hall, moving east at 10 mph (radar indicated). Hazards include 60 mph wind gusts and quarter size hail. Hail damage to vehicles is expected. Expect wind damage to roofs, siding, and trees. 7/27/2016 6:32 PM EDT At 630 pm edt, a severe thunderstorm was located near belews lake, or 8 miles southeast of walnut cove, moving east at 10 mph (radar indicated). Hazards include 60 mph wind gusts and quarter size hail. Hail damage to vehicles is expected. Expect wind damage to roofs, siding, and trees. 7/19/2016 6:50 PM EDT At 650 pm edt, severe thunderstorms were located along a line extending from near pine hall to bethany to near wentworth, moving southeast at 30 mph (radar indicated). Hazards include 60 mph wind gusts. Expect damage to roofs. siding. and trees. Locations impacted include, madison, walnut cove, bethany, monroeton, and dillard. 7/19/2016 6:26 PM EDT At 625 pm edt, severe thunderstorms were located along a line extending from meadows to near madison to near ayersville, moving southeast at 30 mph (radar indicated). Hazards include 60 mph wind gusts. Expect damage to roofs. siding. And trees. 7/8/2016 8:10 PM EDT At 808 pm edt, severe thunderstorms were located along a line extending from near pinnacle to 6 miles south of king to near winston-salem, moving east at 50 mph (public). Hazards include 60 mph wind gusts. Expect damage to roofs. siding. and trees. Locations impacted include, reidsville, madison, walnut cove, danbury, and king. 7/8/2016 7:54 PM EDT At 753 pm edt, severe thunderstorms were located along a line extending from near white plains to near siloam to near huntsville, moving east at 50 mph (radar indicated). Hazards include 60 mph wind gusts. Expect damage to roofs. siding. And trees. 7/8/2016 6:56 PM EDT The severe thunderstorm warning for eastern stokes and rockingham counties will expire at 700 pm edt, the storms which prompted the warning has been replaced with a new warning for southeastern stokes county, southwestern caswell county and southern rockingham county in north carolina a severe thunderstorm watch remains in effect until 1000 pm edt for north carolina and virginia. when it is safe to do so, please send your reports of hail of any size, as well as any reports of wind damage, including downed trees or large limbs, to the national weather service by calling toll free at 1, 8 6 6, 2 1 5, 4 3 2 4. reports and pictures can also be shared on the national weather service blacksburg facebook page and on twitter. 7/8/2016 6:52 PM EDT At 652 pm edt, severe thunderstorms were located along a line extending from lawsonville to intelligence to walnut cove, moving southeast at 35 mph (radar indicated). Hazards include 60 mph wind gusts and quarter size hail. Hail damage to vehicles is expected. Expect wind damage to roofs, siding, and trees. 7/8/2016 6:43 PM EDT At 642 pm edt, severe thunderstorms were located along a line extending from harrisons crossroads to mayodan to hanging rock state park, moving southeast at 30 mph (radar indicated). Hazards include 60 mph wind gusts and quarter size hail. Hail damage to vehicles is expected. expect wind damage to roofs, siding, and trees. Locations impacted include, eden, reidsville, wentworth, mayodan, and madison. 7/8/2016 6:19 PM EDT At 618 pm edt, severe thunderstorms were located along a line extending from near price to near sandy ridge to francisco, moving southeast at 30 mph (radar indicated). Hazards include 60 mph wind gusts and quarter size hail. Hail damage to vehicles is expected. expect wind damage to roofs, siding, and trees. locations impacted include, eden, reidsville, martinsville, wentworth, and mayodan. This includes the martinsville speedway and martinsville airport. 7/8/2016 6:09 PM EDT At 609 pm edt, severe thunderstorms were located along a line extending from near horse pasture to near penns store to near woodville, moving southeast at 30 mph (radar indicated). Hazards include 60 mph wind gusts and quarter size hail. Hail damage to vehicles is expected. expect wind damage to roofs, siding, and trees. locations impacted include, eden, reidsville, martinsville, wentworth, and mayodan. This includes the martinsville speedway and martinsville airport. 7/8/2016 6:01 PM EDT At 601 pm edt, severe thunderstorms were located along a line extending from near horse pasture to near critz to near ararat, moving southeast at 30 mph (radar indicated). Hazards include 60 mph wind gusts and quarter size hail. Hail damage to vehicles is expected. expect wind damage to roofs, siding, and trees. locations impacted include, eden, reidsville, martinsville, wentworth, and mayodan. This includes the martinsville speedway and martinsville airport. 7/1/2016 1:55 AM EDT At 153 am edt, severe thunderstorms were located near wentworth, moving northeast at 15 mph (radar indicated). Hazards include 60 mph wind gusts. Expect damage to roofs. siding. and trees. Locations impacted include, wentworth, stoneville, intelligence, bethany, and monroeton. 6/29/2016 6:14 PM EDT At 613 pm edt, a severe thunderstorm was located 8 miles northwest of greensboro, moving southeast at 30 mph (radar indicated). Hazards include 60 mph wind gusts and quarter size hail. Hail damage to vehicles is expected. Expect wind damage to roofs, siding, and trees. 6/29/2016 6:07 PM EDT At 606 pm edt, a severe thunderstorm was located near ellisboro, moving east at 25 mph (radar indicated). Hazards include 60 mph wind gusts and quarter size hail. Hail damage to vehicles is expected. expect wind damage to roofs, siding, and trees. Locations impacted include, madison, bethany, monroeton, and ellisboro. 6/29/2016 5:45 PM EDT At 544 pm edt, a severe thunderstorm was located over walnut cove, moving southeast at 20 mph (radar indicated). Hazards include 60 mph wind gusts and quarter size hail. Hail damage to vehicles is expected. expect wind damage to roofs, siding, and trees. Locations impacted include, reidsville, mayodan, madison, walnut cove, and danbury. 6/29/2016 5:31 PM EDT At 530 pm edt, a severe thunderstorm was located over dillard, moving east at 30 mph (radar indicated). Hazards include 60 mph wind gusts and quarter size hail. Hail damage to vehicles is expected. Expect wind damage to roofs, siding, and trees. 5/12/2016 7:26 PM EDT The severe thunderstorm warning for eastern stokes and rockingham counties will expire at 730 pm edt, the storm which prompted the warning has weakened below severe limits, and has exited the warned area. therefore the warning will be allowed to expire. however heavy rain is still possible with this thunderstorm. when it is safe to do so, please send your reports of hail of any size, as well as any reports of wind damage, including downed trees or large limbs, to the national weather service by calling toll free at 1, 8 6 6, 2 1 5, 4 3 2 4. reports and pictures can also be shared on the national weather service blacksburg facebook page and on twitter. 5/12/2016 6:49 PM EDT At 649 pm edt, a severe thunderstorm was located over intelligence, moving northeast at 25 mph (radar indicated). Hazards include 60 mph wind gusts and quarter size hail. Hail damage to vehicles is expected. expect wind damage to roofs, siding, and trees. Locations impacted include, eden, reidsville, wentworth, mayodan, and madison. 5/12/2016 6:48 PM EDT At 647 pm edt, a severe thunderstorm was located near bethany, or 10 miles south of madison, moving northeast at 5 mph (radar indicated). Hazards include 60 mph wind gusts and penny to nickel size hail. Expect damage to roofs. siding. and trees. Locations impacted include, greensboro, summerfield, stokesdale, lake brandt, lake townsend, lake jeanette marina, haw river state park and belews lake. 5/12/2016 6:38 PM EDT At 637 pm edt, a severe thunderstorm was located 8 miles southeast of belews lake, or 10 miles northwest of greensboro, and is nearly stationary (radar indicated). Hazards include 60 mph wind gusts and quarter size hail. Minor hail damage to vehicles will be possible. Expect wind damage to roofs, siding, and trees. 5/12/2016 6:23 PM EDT At 622 pm edt, a severe thunderstorm was located near pine hall, moving northeast at 30 mph (radar indicated). Hazards include 60 mph wind gusts and quarter size hail. Hail damage to vehicles is expected. Expect wind damage to roofs, siding, and trees. 5/2/2016 4:52 PM EDT At 451 pm edt, severe thunderstorms were located along a line extending from winston-salem to 12 miles southwest of graham, moving northeast at 30 mph (radar indicated). Hazards include 60 mph wind gusts and quarter size hail. Hail damage to vehicles is expected. expect wind damage to roofs, siding, and trees. Locations impacted include, greensboro, winston-salem, high point, burlington, graham, kernersville, mcleansville, elon college, gibsonville and walkertown. 4/28/2016 4:50 PM EDT At 449 pm edt, a severe thunderstorm was located over bethany, moving east at 30 mph (radar indicated). Hazards include 60 mph wind gusts and quarter size hail. Hail damage to vehicles is expected. expect wind damage to roofs, siding, and trees. Locations impacted include, reidsville, wentworth, intelligence, bethany, and monroeton. 4/28/2016 4:40 PM EDT At 439 pm edt, a severe thunderstorm was located over intelligence, moving southeast at 20 mph (radar indicated). Hazards include 60 mph wind gusts and quarter size hail. Hail damage to vehicles is expected. expect wind damage to roofs, siding, and trees. Locations impacted include, reidsville, wentworth, mayodan, madison, and intelligence. 4/28/2016 3:58 PM EDT At 358 pm edt, a severe thunderstorm was located near danbury, moving southeast at 30 mph (radar indicated). Hazards include 60 mph wind gusts and quarter size hail. Hail damage to vehicles is expected. Expect wind damage to roofs, siding, and trees. 2/24/2016 2:30 PM EST At 230 pm est, local law enforcement reported a line of severe thunderstorms producing damaging winds in excess of 58 mph. these storms were located along a line extending from near monroeton to 7 miles southwest of seagrove, moving southeast at 30 mph. locations impacted include, greensboro, high point, asheboro, randleman, north carolina zoo, thomasville, kernersville, seagrove, mcleansville and archdale. a tornado watch remains in effect until 700 pm est for central north carolina. 2/24/2016 1:59 PM EST At 159 pm est, doppler radar indicated a line of severe thunderstorms capable of producing destructive winds in excess of 65 mph. these storms were located along a line extending from near bethany to 6 miles northeast of badin lake, and moving northeast at 40 mph. 9/4/2015 4:54 PM EDT At 454 pm edt, a severe thunderstorm was located over pine hall, moving southwest at 30 mph (radar indicated). Hazards include 60 mph wind gusts and quarter size hail. Hail damage to vehicles is expected. expect wind damage to roofs, siding and trees. Locations impacted include, king, wentworth, mayodan, madison, and walnut cove. 9/4/2015 4:44 PM EDT At 443 pm edt, a severe thunderstorm was located over madison, moving southwest at 30 mph (radar indicated). Hazards include 60 mph wind gusts and quarter size hail. Hail damage to vehicles is expected. Expect wind damage to roofs, siding and trees. 8/5/2015 9:51 PM EDT At 949 pm edt, doppler radar continued to indicate a severe thunderstorm capable of producing damaging winds to near 60 mph. frequent lightning was also occurring. this storm was located from greensboro to pleasant garden, moving northeast at 40 mph. locations impacted include, greensboro, high point, mcleansville, gibsonville, pleasant garden, jamestown, forest oaks, lake guilford mackintosh marina, lake townsend marina and lake brandt. 8/5/2015 9:32 PM EDT At 930 pm edt, doppler radar indicated a severe thunderstorm capable of producing quarter size hail and damaging winds to near 60 mph. this storm was located near high point or 5 miles southwest of greensboro, and moving northeast at 35 mph. 8/5/2015 9:12 PM EDT At 911 pm edt, a severe thunderstorm was located over sandy ridge, moving northeast at 25 mph (radar indicated). Hazards include 60 mph wind gusts and quarter size hail. Hail damage to vehicles is expected. expect wind damage to roofs, siding and trees. Locations impacted include, mayodan, madison, walnut cove, stoneville, and danbury. 8/5/2015 8:54 PM EDT At 854 pm edt, a severe thunderstorm was located over hanging rock state park, moving east at 25 mph (radar indicated). Hazards include 60 mph wind gusts and quarter size hail. Hail damage to vehicles is expected. Expect wind damage to roofs, siding and trees. 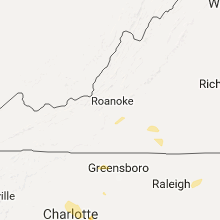 6/2/2015 9:21 PM EDT The severe thunderstorm warning for western guilford and northwestern randolph counties will expire at 930 pm edt, the line of storms which prompted the warning has weakened below severe limits, and no longer poses an immediate threat to life or property. therefore the warning will be allowed to expire. however heavy rain is still possible with these thunderstorms. 6/2/2015 9:19 PM EDT At 917 pm edt, doppler radar indicated a line of thunderstorms capable of producing damaging winds in excess of 58 mph. these storms were located along a line extending from near kernersville to near high point to 6 miles west of randleman, moving northeast at 25 mph. locations impacted include, greensboro, high point, archdale, summerfield, stokesdale, jamestown, lake brandt, lake townsend, lake jeanette marina and colfax. 6/2/2015 9:03 PM EDT At 902 pm edt, doppler radar continued to indicate a cluster of severe thunderstorms capable of producing damaging winds in excess of 58 mph. these storms were located along a line extending from near kernersville to near high point to 6 miles southeast of thomasville, moving northeast at 15 mph. locations impacted include, greensboro, high point, kernersville, archdale, summerfield, trinity, stokesdale, jamestown, lake brandt and lake townsend. 6/2/2015 8:45 PM EDT At 843 pm edt, doppler radar continued to indicate a cluster of severe thunderstorms capable of producing damaging winds in excess of 58 mph. these storms were located along a line extending from near kernersville to near thomasville to 6 miles east of lexington, moving northeast at 25 mph. locations impacted include, greensboro, high point, thomasville, kernersville, archdale, summerfield, trinity, stokesdale and jamestown. 5/11/2015 9:25 PM EDT At 924 pm edt, doppler radar indicated a line of severe thunderstorms capable of producing damaging winds in excess of 58 mph. these storms were located along a line extending from harrisons crossroads to 8 miles north of greensboro, moving east at 25 mph. locations impacted include, summerfield, stokesdale, lake brandt, lake jeanette marina, oak hollow marina, colfax, belews lake and lake townsend. 5/11/2015 9:03 PM EDT At 903 pm edt, doppler radar indicated a line of severe thunderstorms capable of producing damaging winds in excess of 58 mph. these storms were located along a line extending from near price to 7 miles northeast of kernersville, moving northeast at 25 mph. locations impacted include, summerfield, stokesdale, lake brandt, lake jeanette marina, oak hollow marina, colfax, belews lake and lake townsend. 5/11/2015 8:53 PM EDT At 852 pm edt, doppler radar indicated a line of severe thunderstorms capable of producing damaging winds in excess of 58 mph. 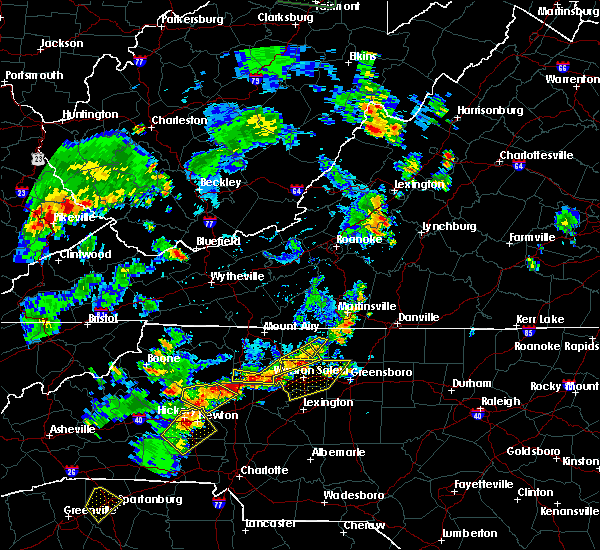 these storms were located along a line extending from near ayersville to near kernersville, moving northeast at 30 mph. locations impacted include, kernersville, summerfield, stokesdale, lake brandt, belews creek, belews lake, lake jeanette marina and oak hollow marina. 5/11/2015 8:41 PM EDT At 841 pm edt, doppler radar indicated a line of severe thunderstorms capable of producing damaging winds in excess of 58 mph. these storms were located along a line extending from sandy ridge to near kernersville, moving east at 25 mph. locations impacted include, greensboro, winston-salem, high point, kernersville, summerfield, stokesdale, walkertown, lake brandt, belews creek and belews lake. 5/11/2015 8:31 PM EDT At 829 pm edt, doppler radar indicated a line of severe thunderstorms capable of producing damaging winds in excess of 58 mph. these storms were located along a line extending from near danbury to 6 miles north of winston-salem, and moving northeast at 25 mph. 4/20/2015 3:43 PM EDT The severe thunderstorm warning for north central guilford county will expire at 345 pm edt, the storm which prompted the warning has moved out of the area. therefore the warning will be allowed to expire. to report severe weather, contact your nearest law enforcement agency. they will relay your report to the national weather service raleigh. 4/20/2015 3:31 PM EDT At 331 pm edt, doppler radar indicated a severe thunderstorm capable of producing large hail up to ping pong ball size and damaging winds in excess of 58 mph. this storm was located near bethany, or near wentworth, moving northeast at 45 mph. locations impacted include, summerfield, stokesdale, lake townsend marina, lake townsend, monticello, haw river state park and lake brandt. 4/20/2015 3:15 PM EDT At 314 pm edt, doppler radar indicated a severe thunderstorm capable of producing large hail up to ping pong ball size and damaging winds in excess of 58 mph. this storm was located 7 miles southeast of belews lake, or 11 miles southeast of walnut cove, and moving northeast at 45 mph. 4/20/2015 3:05 PM EDT At 304 pm edt, doppler radar indicated a severe thunderstorm capable of producing quarter size hail and damaging winds in excess of 58 mph. this storm was located near kernersville, or 8 miles northeast of winston-salem, moving northeast at 35 mph. locations impacted include, greensboro, winston-salem, high point, kernersville, summerfield, stokesdale, walkertown, rural hall, lake brandt and lake jeanette marina.